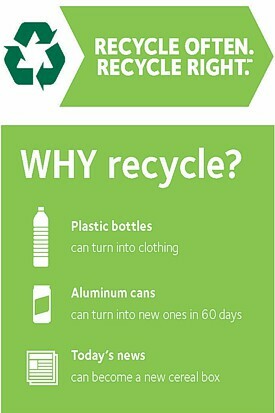 To keep our streets and our environment clean, we should recycle regularly. It is the responsibility of everyone as citizens of Whitehall Township, of this country, and of this world to try to preserve what we enjoy for the future generations and to make our home even more of a remarkable place and aesthetic community. All recyclables are picked up each week on the same day as your trash pickup. Holiday pickup schedule for trash also applies to all curbside recyclables pickup. Put all your single stream curbside recyclables in your toter/cart. Breakdown and put in Recycling Toter/Cart. Large amounts take to the Range Road Facility to the compacter. Newspaper, home office paper, junk mail, magazines, telephone books, cereal boxes , paper towel rolls, soda boxes (paper board) flatten all cardboard. Please call the Township at 610-437-5524 Ext. 139, 100 or 165 and a Single Stream Recycling Cart will be delivered to your new home if you have completed and submitted a moving permit. The previous owner should have left the Whitehall Township Recycling toter/cart Container(s) If not call the former home owner and have them return the Toter/cart. If your home was a foreclosure/Sheriff Sale we will check the master delivery list to verify that it was not delivered before delivering a new cart. We will not deliver a toter/cart unless you have a completed moving permit. How should I place the cart at the curb or in my alley? Place the wheels to the back closer to home and the bar should be to the street or alley. If your home has a driveway, place the Single Stream Recylcing Toter/Cart to the left of the driveway and your refuse to the right of the driveway. Do Not dump into pipes! Antifreeze will contaminate drinking water. Recycle aluminum and/or steel (tin) for curbside pickup. For health purposes, rinse can thoroughly or run thru dishwasher and remove or push in sharp lids. Do not recycle food trays or foils. May be returned to any station or retail store that sells them. Also, automobile or lead acid batteries can be dropped of off at Recycle Center. Cardboard items, such as cereal boxes, soda boxes, towel rolls etc., Flatten and place in recycling container. Larger carboard pieces flatten and place bundles next to recycling containers, cannot be more than 3'x1'x1'. Please take large quantities of residential cardboard to Range Road Recycling Drop Off Center. Never place empty electronic cardboard boxes for curbside pickup take to Range Road Recycling Center to be compacted. Christmas trees are collected at the curbside during the first full and second week in January. NO TREE BAGS, TINSEL, ETC. Electronics WILL NOT BE PICKED UP AT CURBSIDE BY Waste Management. Effective June 4th, 2012 No Electronics of any type will be picked up at curbside by the Township Collector. This includes Telephones, keyboards/Mice, LCD Monitors, Stereos & Speakers, Printers/Fax Machines, Small Appliances, DVD Players/VCR's/Microwaves, Computer Monitors. Please see the firms below that will take the material. Whitehall Township conducts an annual electronic recycling event which will be on May 18, 2019 from 9 A.M. to 1 P.M. REFER TO YOUR SPRING/SUMMER NEWSLETTER FOR INFORMATION AND CHARGES. GER Solutions of Hanover Twp AERC Recycling Solutions of Allentown provide an electronics recycling service. Computers, monitors, printers, laptops, keyboards, radios, stereos, modems, TV's, VCR's, microwaves, telephones, etc., are accepted and fees will apply. RANGE ROAD is behind the Giant food store. The Drop-Off Center, is located at the corner of Eberhart and Range Roads, they will take any item that can be put out on the curbside, as well as: scrap metal, four tires without rims (Township Residents ONLY), clothes and textiles, telephone books, etc. The Center is for residential use only and is NOT to be used by businesses! The Recycling Drop-Off Center is closed on holidays and during periods of inclement weather. Hours M-W-F 9:30 -12PM 1PM to 4 PM and every third Saturday 9 AM to Noon. Located on the right side of the building in Industrial Park across the street from the FED EX planes. As of May 27, 2013 there is a fee for TV's and for miscellaneous electronics. Items such as refrigerators, freezers, dehumidifiers, air conditioners, etc., containing CFC's (Freon) require special handling. State regulations mandate the Freon to be removed upon disposal. Bottles and jars that are clear, green and brown should be set out with recyclables at the curbside or taken to Recycling Drop-Off Center. Do not recycle window glass, light bulbs, drinking glasses, dishes, or ceramics. For a greener and thicker lawn, compost your lawn clippings to give your lawn valuable nutrients. Just mow your lawn frequently and let the clippings lay on the freshly cut lawn! Otherwise, grass will be collected curbside the day after regular collection starting April 1, 2019 and transitions into leaf collection and ends December 2, 2019. Grass must be in rigid, open containers, no cardboard boxes or plastic bags. Do not dump oil into pipes! One quart of motor oil can pollute up to 150,000 gallons of drinking water. Consult w/place of purchase of oil. Newspaper, home office paper, junk mail, magazines, etc. Place items in brown bags if you have an open milk crate recycling container if not in the enclosed recycling container. Do not include PLASTIC bags. Latex Paint can be placed out with trash if contents are dry with lid removed. No. 1 through No. 7 plastic products including most beverage containers-the plastic number is usually found on the bottom of the product. Should be set out at the curbside with other recyclables or taken to the Recycling Drop-Off Center. For questions regarding the disposal of other plastics, contact out Public Works Department. TAKE to WEIS, GIANT, WEGMANS, BOSCOV'S, STAPLES. Containers in lobby of stores to be recycled. Call the Public Works Department for instructions. Take to the Recycling Drop-Off Center at Range Road. Can be placed with newspapers at curbside, taken to the Recycling Drop-Off Center. Residents may take four tires (without rims) to the Recycling Drop-Off Center. Lehigh County program has been eliminated due to budget cuts. Theft of recyclables IS A CRIME!!! Any resident that is a witness to a person or persons, other than Waste Management or Township Park and Recreation or Public Works employees taking recyclables, should react immediately and report the incident to the Whitehall Township Police Department at (610)-437-5252. Pennsylvania Act 101 and Whitehall Township require that businesses, professionals, non-profit organizations, institutions, and industrial and residential landlords must recycle plastic containers, glass bottles and jars, newspapers, office paper, magazines, junk mail, phone books, cardboard, and yard waste. It further requires that you report your recycling information to the Township each year.